I’m sure most of you are wondering what this map of the United States of America is all about. You can see all the little rock hammers. But can you see the one little blue rock hammer inside? Well that lil blue rock hammer represents the 1% of all geoscientists that are black. That lil guy is BlackGeoscientists. Here’s the raw data of what geosciences looks like based on data provided by the National Science Foundation (for those of you analytic-type people that like looking at data tables). As for me, I’m a visual person that enjoys looking at maps. So, I’m going to break down that data table in the following maps. This is what America looks like. 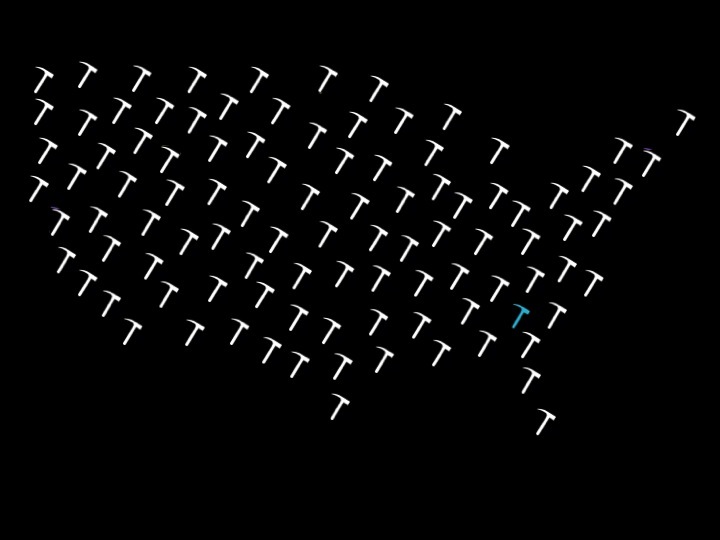 In this map are 100 little rock hammers, therefore a single rock hammer represents 1%. The rock hammers have been scattered randomly over the US, and do not represent actual geographic locations of people. Please note that Others (including American Indians) are not represented on this map. Here we can see why people of color are referred to as minorities. But also notice there is a certain level of interconnectedness amongst those blue, green, and purple hammers. In most instances you wouldn’t have to jump more than one white hammer to reach a hammer of color. It may not be perfect, but this lil baby is ours. Our America. Our fairly colorful map has lost a lot of it’s color! And it’s lost almost all of it’s racial interconnectedness. What’s interesting about this map is this is what it actually felt like for me during my undergrad. I would see other people of color at conferences, but at my own home institution I was the only one. I always felt welcomed and included by my classmates and my professors. But no matter how deep the friendships were, I couldn’t shake this sense of alone-ness, of other-ness. I would walk the quad of my university and see scores of people that looked just like me, and then I would walk into my geology classes and I was an alien. 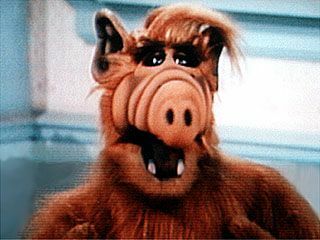 Maybe an alien like Alf, loved by most, but still an alien. Me during my undergrad. A friendly lovable alien. But this is where it gets interesting…Who get’s employed in the geosciences? Welp…It’s clear someway somehow those few hispanic and black students that were awarded a bachelors degree in geosciences don’t go on to employment. Do they switch careers? Or is it they can’t find employment with their geoscience degree? This is where geography is an important part of the story. I won’t be discussing that in this blog post but I will cover it later, I promise. 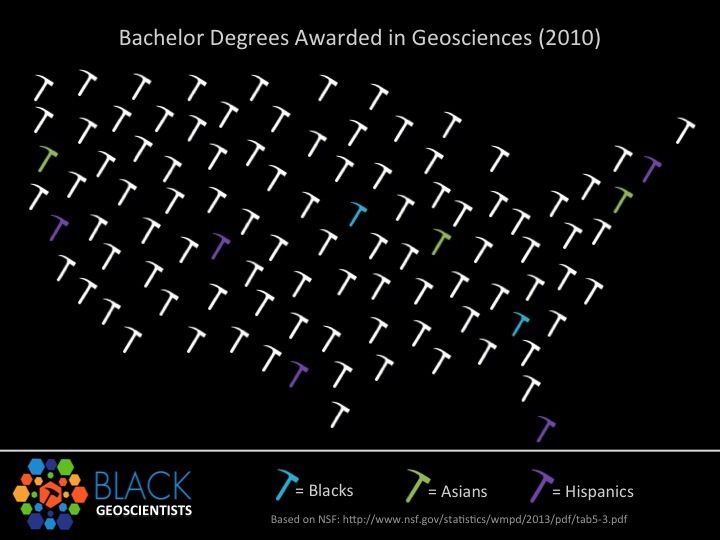 Just know for now, that there is a huge discrepancy between where students of color are awarded their degrees in geosciences and where the actual jobs are. Please note that there is an overrepresentation of White and Asian geoscientists that are employed. And this map is what geoscience feels like to most black people. We’re back to our original infographic. If you were paying attention I just said this “is what geoscience feels like to most black people.” Not most black geoscientists, but most black people. Whether they’re a chef, teacher, writer, nurse, lawyer, or actor there is a widely held (unspoken) belief that geology isn’t for black people. And unfortunately, the statistics turn that belief into a fact. This is actually where my struggle starts. See part of my alone-ness, my other-ness, my isolation, isn’t just that I’m black in a sea of non-black, it’s that even my fellow blacks look at me like I’m Alf! I am an alien amongst my own people, no matter who those people are. I’m an alien amongst geoscientists, and I’m an alien amongst black people. The BlackGeoscientist problem isn’t as simple as a leaky pipeline. To a lot of people of color, the pipe seems to be capped with a semi-permeable membrane, one in which they were never meant to go through. Geoscience has to change it’s image and tackle the underlying belief system if anything is going to change. This is not the image geoscience should want in any community. I’d like to break the cycle of the beliefs supporting the facts and the facts supporting the beliefs. Image is one part, only one part, but one part. No matter what, that lil blue rock hammer does exist! So let’s celebrate the hell out of it. Also if you aren’t aware, NSF provides awesome data tables on Women, Minorities, and Persons with Disabilities in Science and Engineering. They also put out a Digest that summarizes a lot of the data and provides some great graphics as well. A few years ago, when I was studying for my MS geology degree, I worked with a group of white volunteers trying to peddle earth sciences as a viable career choice to primarily-minority community college classes. Because of the demographics of my area, most of those minority students were Hispanic. They were gracious, polite, and totally uninterested. We were NOT getting our message across. OTOH, most of my fellow geology grad students, like myself, didn’t have undergraduate degrees in the earth sciences. We took a class somewhere along the way to fulfill a requirement, or started doing some reading, or got really interested in understanding our local landscape-related issues, or whatever… and it dawned on us that hey, this is interesting, and by the way there are jobs! By the same token, most of our upper-division undergrads didn’t start out with majors in the earth sciences, they got hooked in somewhere along the way. So I’m not convinced there’s a good understanding of how someone in majority culture chooses to become an earth scientist, let alone someone from a minority culture! I used to be a software engineer, working in a field that is flooded with sexism, mostly perpetuated by people in complete denial. That’s another field where most minorities aren’t well-represented, for reasons that us white folks don’t understand. But having experienced entrenched sexism over two decades, I’m sure it’s possible that I and my white colleagues are perfectly capable of being in complete denial about covert racism. As far as figuring out what to do about it, I haven’t got a clue. I’m just convinced that these fields are missing out on the talents of a lot of people. LOL! I love the fact that the minority college students were polite yet uninterested. I’ve faced that same barrier when doing geoscience outreach. In my experience, some people of color can even go as far as finding it interesting but they don’t see it as a viable career and therefore sort of set it aside as a potential hobby to explore. And I agree! That was a great observation! Most geoscientists, irrespective of race, didn’t start out as geoscience majors. I think there is a pervasive lack of knowledge about geoscience in mainstream culture. Most of us didn’t have access to how cool geology is until we stumbled upon it by chance. That’s my story too. I took a geology class as a science elective, and got hooked. I’d love more work done on geoscience career/major selection across all races. 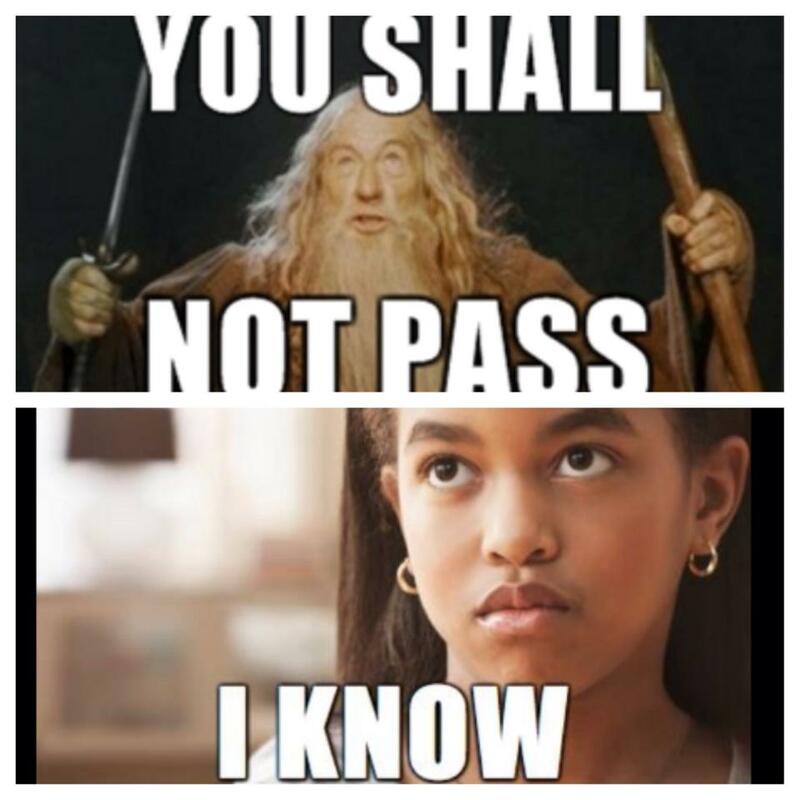 I currently do a lot of outreach to get girls into coding and its weird. I agree, I don’t hear many horror stories in the tech industry. Instead there is just a lack of diversity. A sort of eerie silence of all non-majority voices. But one of the things I had accepted during my geo grad work is that most of the racism I came across was unintended by well-meaning intelligent community-oriented folk. So I’ve stopped blaming and I’ve stopped feeling targeted. But that’s one reason why I created this blog, to add a voice to the discussion that I haven’t heard yet, the voice of black geoscientists. Lastly, I LOVE your last sentence! That’s exactly why I strongly believe in diversity. It isn’t just a social justice issue. It’s the fact (or my belief) that geoscience and sciences in general would be BETTER if everyone was at the table. Thanks for the insightful comment Karen! Thanks Garry for including me in your blog! And there is nothing wrong with being an old white guy, all my mentors have been old white guys. I just want to know that black people feel they have access to geosciences as a career. I think geology too damn cool to not have everyone involved. I was looking at Dana Hunter’s blog and she shared this link to this spot, and thus this late comment. I totally get were you are coming from. I was a female geologist who graduated in the 70’s. In most of my classes I was the only female. There were no female professors even though two of the male professors were married to female geologists with Phds who wanted to be on staff. It was hard to be taken seriously and it was really hard to get into the masters program. When I was there, about 20% of the department was black males & no black females. All of the blacks were from African countries and when they graduated they went back to their countries since their countries were paying for their education. Because we were the oddballs some of them became my friends and I knew how hard it was for them. I can understand it being hard for you too. Now I’m glad to see things have vastly improved for the females and my Alma mater does have female professors on staff, but unfortunately no blacks. All I can say is I do hope things will improve someday, especially for you. Where I live, I’ve seen some major changes in accepting blacks, we do have a black female mayor and other city officials. The main thing is for people to get educated. & for you hang in there!! Someone has to pave the way and its not easy. You doing it and it will make a difference to someone someday! I tried to hang in there but gave it up when I had children. For 25 years I’ve stayed away from geology, Now that I’m not working, I thought I could get involved with it again through blogging. Some prejudices never die and I’ve had to deal with an old relic who doesn’t want me around. I thought people would be more open now but this one person has convinced everyone to ostracize me. I do hope you never have that happen to you. Best wishes to you & good luck in all your endeavors.